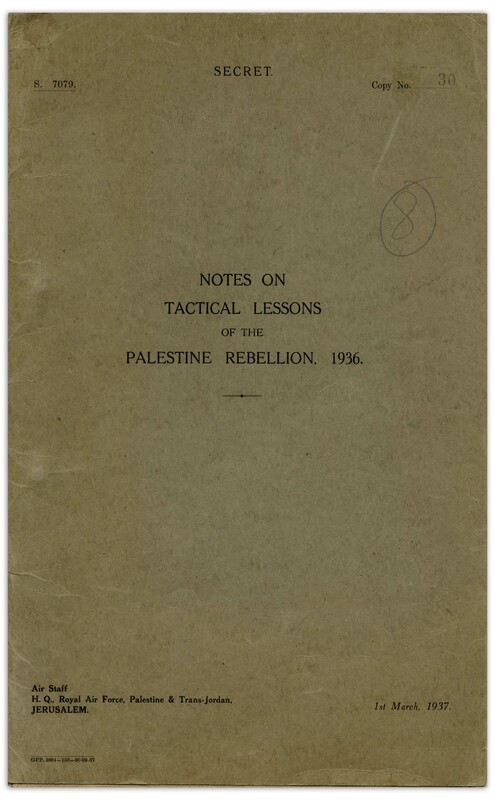 Intriguing publication published by the British Air Force, entitled ''Notes on Tactical Lessons of the Palestine Rebellion, 1936''. 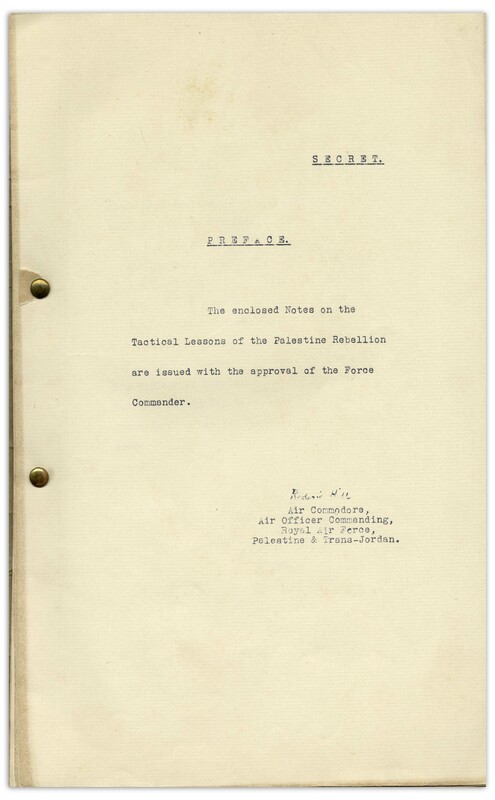 Jerusalem: Air Staff, H.Q., Royal Air Force, Palestine & Trans-Jordan, March, 1937. 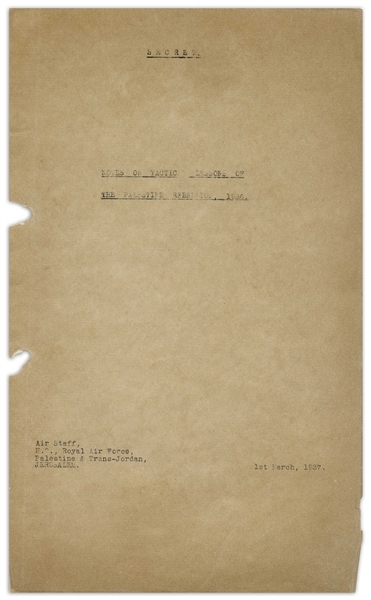 Booklet, marked ''SECRET'', was published in response to the 1936 Arab Revolt, which lasted until 1939 (named ''The Great Arab Revolt'') in part because of the perceived response by the British government to the early insurgency, outlined here. 18pp. 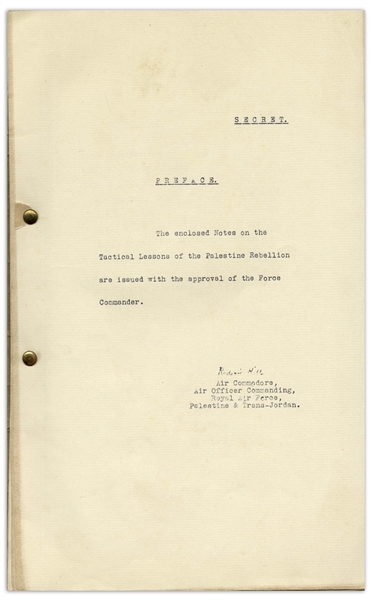 booklet gives tactical directives to British pilots in response to the insurgency, described as ''armed bands and saboteurs in hill country and rural districts, directed against the civil organization, armed forces, Jewish interests and road, rail and telegraph communications.'' Air tactics are presented including how to locate and hit the enemy with machine gun and bomb attacks. 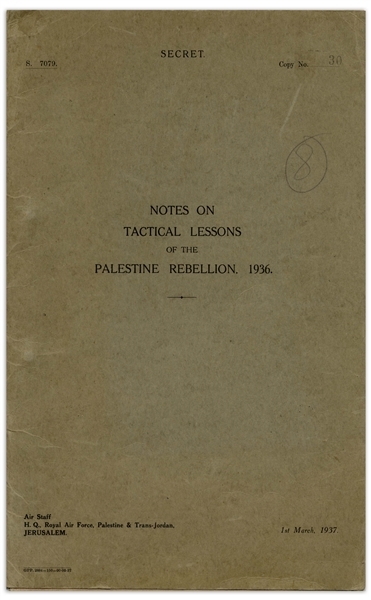 The last section of the booklet outlines various attacks by Arab groups in Palestine during the summer of 1936. Measures 8.25'' x 13''. First page detached from two brads binding the document. Light toning and wear with pencil mark to cover. Very good condition.